Kirsan Ilyumzhinov re-elected for FIDE President! Kirsan Ilyumzhinov is re-elected for FIDE President! As per 14:30 CET on September 29th, the results are in. Ilyumzhinov wins with 95-55. 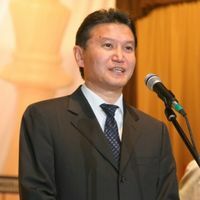 Thus Kirsan Ilyumzhinov will be President of FIDE in the period 2010 – 2014. The election day started in Khanty Mansyisk early in the morning. In a hall packed with members of federations the electoral process began. As with every important election worldwide, a scandal is normal to take place. This time to no surprise it came from Kasparov, who questioned the proxy list and procedures for the current elections. The proxy list included 56 countries that have entrusted the their right to vote (without change of position) to other member states participating. More about this situation later. The actual election in the booths started at 12:00 CET and continued for two hours. Election results were announced, with Kirsan Ilyumzhinov winning 95-55 This is loss for Anatloy Karpov and Gary Kasparov is comparable to the result of Bassel Kok team four years ago, when the result of the ballots was 54-96. Kirsan Ilyumzhinov will be heading FIDE for one more term until 2014. Here is more on the candidates and all events during the electoral campaigns. Stay tuned for more updates on Chessdom.com! FIDE elections take place every 4 years during the Chess Olympiad, the largest national teams chess event. The 2010 FIDE elections in Khanty-Mansiysk were scheduled for September. The FIDE President Kirsan Ilyumzhinov has announced that he will seek re-election for the term 2010-2014. The other candidate, former World Champion Anatoly Karpov, has also announced that he will run for the office of FIDE President. No other applications were received until the deadline in June and the following presidential tickets were submitted. 6.Treasurer – Mr. Nigel Freeman nominated by Bermuda. 6.Treasurer – Mr. Viktor Kapustin nominated by Ukraine. The elections started with the Russian Chess Federation endorsing Kirsan Ilyumzhinov. Some of the board members protested against the news, despite the fact the head of the board members Dvorkovich confirmed it. All this led to the Ilyumzhinov opposition calling a meeting on May 14th, in Moscow. At the Council were present 17 (some sources claim 18) out of the 32 delegates, and Kasparov as guest. Kasparov pointed to the previous decision as “non legitimate” and the delegates elected Karpov as candidate of the Russian Chess Federation. On their turn, the Ilyumzhinov supporters claimed the election is non legitimate because despite having quorum, the meeting did not feature the head of the board of members Dvorkovich. Dvorkovich himself explained the situation for Gazeta.ru, “Both meetings were not legitimate. At one of them there was no quorum, on the second there was no President of the Board.” (more from Dvorkovich here and here). FIDE President Kirsan Ilyumzhinov did not attend any of the meetings and lamented the situation, comparing it to the FIDE and PCA schism, but this time at internal Federation level. Finally, the Russian endorsement went to Ilyumzhinov and as TWIC reported, it virtually ended the chances of Karpov for the FIDE race. Although Karpov announced 20 countries supporting him early on, Kirsan Ilyumzhinov surpassed him in numbers only a few weeks after claiming the support of 35 countries. Soon the support for Kirsan Ilyumzhinov grew to 50 countries and at that time Ilyumzhinov launched his most secure bid for winning the elections – he proved that he will continue investing in chess	as done in previous years. A $500,000 USD sponsorship package was provided for the organization of two new tournaments – Caribbean Cup and Latin American Cup. $1 million was provided for a series of Campomanes Memorial tournaments. Ten $100,000 tournaments were created in the 10-member ASEAN nations starting with the Campomanes Memorial tournament this August in Manila, Philippines and then in Vietnam, Indonesia, Malaysia, Singapore, Myanmar, Thailand, Laos, Cambodia and Brunei. Step by step Karpov’s tactics started resembling a political campaign of Kasparov, and that was noted by several sources. Kirsan Ilyumzhinov himself criticized the destructive tactics of his opponent in an open statement a few days before the Olympiad. Kevin Spraggett commented, “Rather than throw in the towel, Karpov and Kasparov began a campaign of character assassination of internationally respected chess personalities who would not join or support their campaign; they systematically worked to undermine democratically elected chess officials in Peru and Argentina by using the tremendous influence that they wielded by way of their cult personalities, and celebrity status to gain easy access to political figures who were ignorant of chess affairs and of chess politics. These campaign tactics were nasty, abusive and unprecedented in FIDE’s long history. The last attempt of the Karpov – Kasparov duo was to sue FIDE, but it failed both on jurisdiction of Karpov Inc and on cross examining. Court of arbitration for sport (CAS) issued its decision in the arbitration opposing FIDE to Karpov 2010 Inc. and to five national federations (Federation Française Des Echecs, Deutscher Schachbund, Schweizerischer Schachbund, Federatsiya Shakiv Ukrainy and United States Chess Federation). It dismissed the case of Anatoly Karpov and has confirmed Kirsan Ilyumzhinov’s candidature for FIDE President is valid. The first day of the hearing of the FIDE Presidential elections case in the CAS sports court in Lausanne was held last week and seems to have been the key to the final decision as well. As it is usual in such proceedings day 1 was about jurisdiction. Karpov Inc., the entity filing the lawsuit and backed by several federations, was not given jurisdiction, as it is not part of FIDE, but a private one. This did not end the case, but put it in rather strange situation – no jurisdiction to Karpov Inc, and all the costs for the case were to be transferred to the national federations that continued the dispute, something that until then was supposed to be covered by Karpov Inc. The case continued with hearings of both sides, after which the claims filed by Federation Française Des Echecs, Deutscher Schachbund, Schweizerischer Schachbund, Federatsiya Shakiv Ukrainy and United States Chess Federation are dismissed. “For the sake of completeness, the Panel added that the withdrawal by the Argentinian of its endorsement of the Ilymuzhinov ticket does not affect the nomination filed by it prior to the applicable deadline,” commented FIDE.com official report.